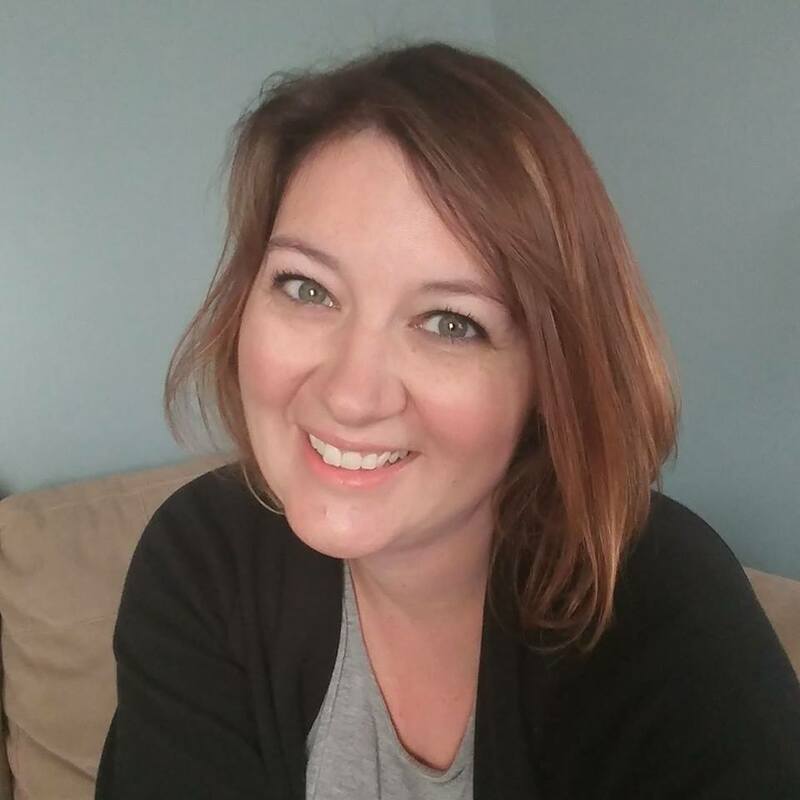 Last November, was my 10th wedding anniversary and it’s exciting to make it to these big milestones in your marriage especially when you hear of so many stories of friends going through a divorce. My parents were married for 29 years before my dad passed away and my in-laws have been married for over 40 years. Now the hard part of this round-up was to decide on a recipe! I had it narrowed down to three different ones and I polled my Facebook friends to help me make a decision. The hands down winner was Mini Maple Pecan cheesecakes! I have plans to make the second choice since my husband specifically requested it. I( made these mini cheesecakes to have at my daughter’s 8th birthday party last weekend for the adults. They were so good and the plate was empty in no time. 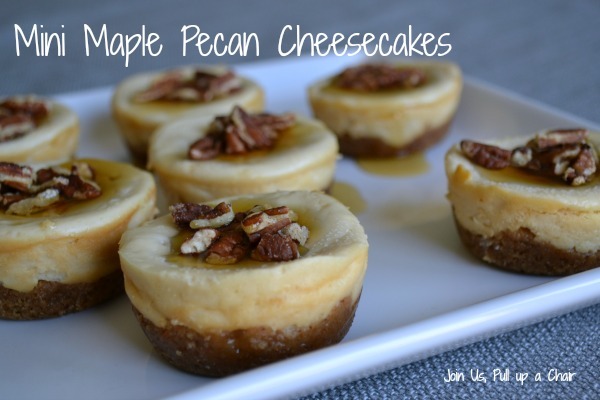 I loved the hint of maple in the cheesecake and you can’t go wrong with a maple-pecan topping! Lightly grease a 12 cup muffin pan and preheat oven to 325 degrees. In a medium bowl, combine the graham crackers, almond meal, brown sugar, maple syrup and melted butter. Mix well until all the dry ingredients are wet. Divide the crust mixture between the 12 cups and lightly press the crust on the bottom and partially up the sides of each cup. In the bowl of a stand mixer, beat the cream cheese until it is smooth. Add in the egg and mix until combined. Add in the sour cream, vanilla extract and maple syrup. Mix until combined and then stir in the brown sugar and cornstarch. Divide the mixture between the 12 cups and fill about 3/4 full. Place into the preheated oven and bake for 18 to 20 minutes or until the cheesecake is set. Remove from the oven and place on a wire rack to completely cool. Remove from the oven and place in air tight container in the refrigerator until you’re ready to serve them. When ready to serve, mix together the crushed pecans and maple syrup. Spoon them over the mini cheesecakes and indulge! I love these flavors and your minis look fantastic!! I love the minis. I don’t know why I never thought of that! Thanks for helping me celebrate, Heather. Maple & pecan is an awesome combo. I can only imagine how delicious these must taste! Yum! These look just perfect! These would be nice for a brunch too I think. All of these cheesecakes are killing me! They look so good! 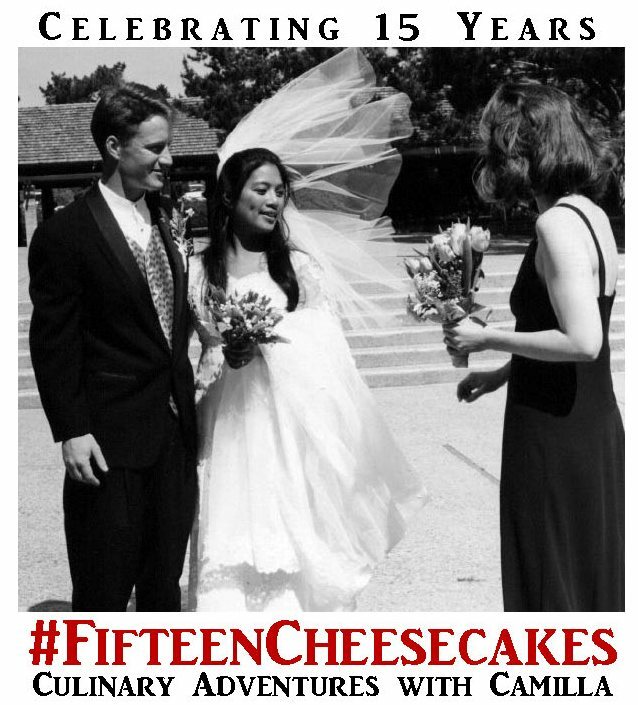 Beautiful choice for Fifteen Cheesecakes. Yum, this sounds absolutely delicious! Love the mini size. I will definitely have to try this. Oooh these would be a hit at Thanksgiving! I love pecan pie, and miss making it. (I developed a nut allergy) I can just imagine how yummy these would be though. Kudos on making them minis. I need to try that soon, it sure would make serving a lot easier.